No one knows who is doing it. But it’s me. I am one the sneaking around our hallway, posting sticky notes with poems on them, and creating a sort of graffiti display of poetry in an empty display case. I’ve been watching the kids slow down, take a look and wonder who it is who is putting those small poems in the large case. It all began when I was doing a Scholastic book order a few weeks ago. I saw this collection called Post This Poem (which, frustratingly, I cannot find online anywhere, so I can’t share a link with you.). I had some bonus points from our recent orders. Why not? It’s a cool little thing. One hundred poems and stanzas of longer poems on colorful post-it notes. Each morning this week, I have been adding a few more poems in the morning before school starts. Emily Dickinson, Walt Whitman, Carl Sandburg and many others now sharing the hallways with our students. Don’t tell anyone. It will be our little poetic secret. This entry was posted in Day in Sentence, my classroom. Bookmark the permalink. I love it, the poetry bandit! 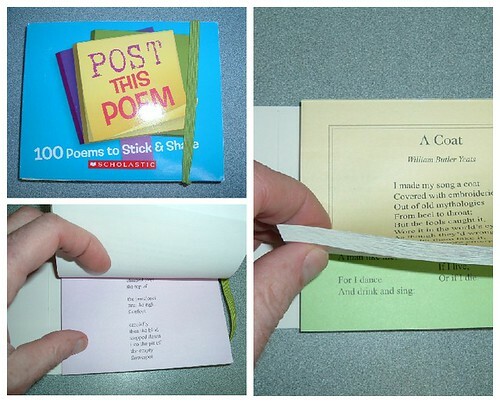 I think it would be fun to have my students do this for Poem in your Pocket Day. I bet you are having fun with this. It sounds like a great project. I love a good mystery in schools, especially when I know the perpetrator. I bet you are having so much fun watching the reactions. I wonder how many mystery poems will spring up in schools after this post? Great, creative ideas are all around. How great that Scholastic had this idea and inspired you to action. Oh my gosh! How cool! I love this idea! I must share it with my colleagues. 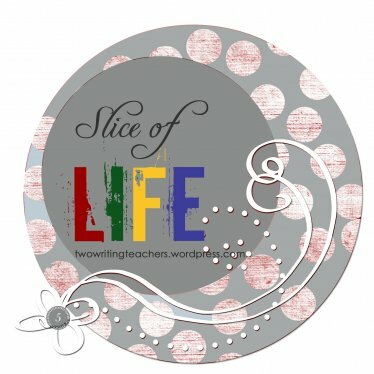 What a delightful treat for your students! That is such a good idea. One year my first graders wrote their spelling words on cards, glittered them and sneakily posted them around the first grade wing. They put up math facts cards, too. It was fun to see the other classes slow down on the way out the doors to read the words and try to do a math fact…great idea with the poems! Fun! I am so going to do this when we get back from spring break! Kevin, this idea appeals on so many levels. It reminds me of the poetry in motion projecti used to see on the New York subway. I loved seeing snippets of poetry in the carriages and began to actively seek it out when traveling about the city. More power to you with this secret project. Fun! Are you going to tell the kids or can they guess with some clues you’ve given them? What an amazing idea! Nothing like a little intrigue to catch their interest. If you ever do find the link, I’d love to have it. Oh how cool! Yes, please let us know if you find the link. That is very cool. I wish Scholastic hadn’t kicked us international folk out. Their new international setup is not nearly as good and I miss these fabulous finds. Enjoy being the sneaky poet.